About three months ago Susan Carter Morgan sent me a message inquiring about the work we are doing with UMW Blogs. She’s an Instructional Technology Coordinator and English teacher locally at the Fredericksburg Academy, and was pretty interested in bringing something like UMW Blogs to her K-12 institution. We talked briefly back and forth via email about the details, and then a couple of weeks later set up a meeting here at UMW with a few interested teachers and her school’s principal. Less than two weeks after that meeting Susan got a Bluehost account, grabbed a domain, and setup a full-blown publishing platform using WPMu for her school at the low, low cost of under $200. 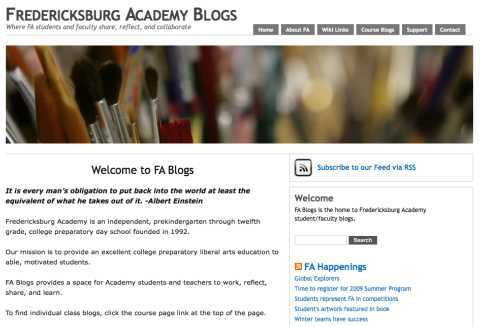 Over the course of a gestation period of only a few weeks Fredericksburg Academy Blogs was born. We shared some plugins, themes, and the like with them, but Susan took the installation and ran with it. And the fruits of her vision are pretty impressive, I looked in on the FA Blogs sitewide feed the other day and I have 231 unread posts! Wow, imagine that, an elegant, open educational publishing platform for K-12 that is nurtured and supported by a forward-looking technologist, some awesome teachers, and a supportive administration. That’s what it’s all about, and while doing this stuff is not necessarily dependent on all these factors aligning—for that is rare, indeed— it sure is nice to see teaching and learning with technologies blossom when they do! Bully for Fredericksburg Academy for opting for a fast, cheap, and out-of-control appraoch to teaching and learning technologies that basically tells your students that you don’t hate them or distrust them, but rather are intent on giving them an open space to make their voices heard. Sometimes a little local sharing goes a long way! This entry was posted in wordpress multi-user, wpmu and tagged Fredericksburg Academy, wordpress multi-user, wpmu, wpmued. Bookmark the permalink. Thanks so much for all of the sharing and help! My middle school students love working on their blogs. In fact, they are thoroughly annoyed with me when we cannot on a given day. I am getting ready to go in and change the email notifications because I can’t handle the barrage of emails that I get from their posts and comments. Thank goodness for google reader! For anyone looking to start their students blogging…JUST DO IT!!! I have seen their enthusiasm and grades improve. Let me just tell you that what you and Susan have spear-headed over at Fredericksburg Academy is exemplary, an the enthusiasm both of you have for imagining technology as a space for imagination and creativity is inspiring. I’d like to take some little credit for all this, but it is all too apparent that you all saw the possibilities and kicked it up a notch, the technology was just a detail along the way. Looking forward to just how much further you will take—it is all so very encouraging. I don’t have much time to write b/c I’m helping another teacher syndicate her blogs today! But thanks so much for your willingness to share, to step outside your own institution. We are loving the platform–and once I get the hang of all the backend technical stuff, I can clean up the random code that I hope people won’t see when they visit. I’m loving the learning. Hahahahah, hard at work, and the syndication bus is moving forward. Avanti! Avanti! Nice work. I think of my kids in HS and college. Particularly the one in high school is not a big writer. Without being prescriptive about it, if the schools nudged kids in the direction of blogging a journal for whatever fancy strikes them, think of the benefits. My students love that it is their space. They are writing about anything and everything. I am not stifling what they are writing except within the context of “school appropriate”. Because of that they are not only writing, but we are building community. We are learning about each other…and writing at the same time. I am also finding that the engagement of my weaker students has increased. It is as if their voice is valid now. Is the other side of this that of teaching them how to follow each other, to start, with an aggregator? My cohort for my MA were forced to journal with blogs, but other than physically surfing to each other’s to see when something changed, they really had to be guided to the value of opening a feed reader. However, once they got it – vavoom … if they remembered to actually open their reader. I often think that understanding RSS is the underlying key to getting the value through. Sure like this project though. It’s a whole different mindset to writing for, and interacting appropriately, in the online, 2.0 infused world. You make a great point. 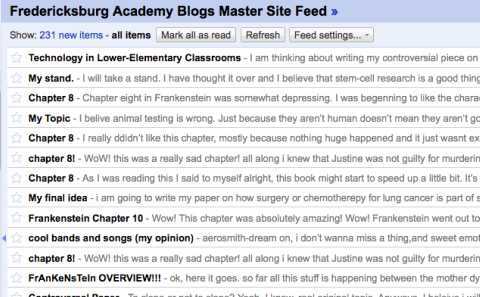 I hadn’t thought of showing them how to set up a google reader for their classmates’ blogs. I just started using one. The posts that they categorize for our class go to our class blog, but there is so much great “non-class” stuff going on there too. I used my gmail account +student name to create their blogs so I get email notifications of their activity, but the sheer number of emails was driving me nuts. Using the Google Reader for it has been much easier. I will teach them about a Google Reader next week and set them up to follow all of the blogs. Different context, but same principles apply. Students in my course (http://the-ed-rush.blogspot.com/2009/02/media-and-identity-in-middle-east-north.html) are blogging as well as following blogs in the Middle East, and one of the first things I showed them was Google Reader. It has made quite a difference, I am certain, in fostering the conversational nature of the blogs, the commenting and responding. Well worth doing. And, wow, I am impressed with what Fredricksburg Academy are doing – hope my kids get to do similar things in middle school, or sooner. Bully for the Bava. Those comments above speak so loudly. And kudos to these educators for not letting fear get the better of them. Excellent work and nice job to all involved. It is great to hear how well the students are taking to the blogs – a online space that is their own is a powerful thing. I also second Brian’s comment – overcoming the “fear factor” is the first step, but often a difficult one. James, I did have them start Google Reader for that reason–to be able to follow not only each other but other blogs of interest. For example, we are reading Frankenstein, so they are doing Google Alerts in their readers for scientific/tech discoveries. And your comment about prescriptive writing–sometimes it needs to start there. My kids had blogs but didn’t actually write anything until I gave them a prompt. Now that they are beginning to get comments, they are branching out. They are supporting each other’s ideas, too. I’m glad to see Carey’s kids more willing to just write. By the time they get to me, my hope is we won’t necessarily need to prompt. This is just amazing to see and read about. Seeing a K-12 environment embrace this kind of open publishing is really pretty amazing. Even only a handful of the faculty put the environment into practice, there will be dozens of kids being exposed to the notion of becoming a public intellectual. If she’s considering her online social persona at this early stage, there’s a good chance some drunken Mexican spring break party photo on Facebook or Flickr won’t come back to bite her later. Maybe that’s another positive effect of this kind of approach. Gets them thinking in very real terms about how to be a smart online person. Think of what her life will be like in 20 years, with where web technology is going. You are totally correct. I think too often we expect our kids to just know instinctively how to have a positive online footprint, and yet we understand we have to guide them through everything else in the world. We would never send them on a field trip to the ballet without talking about proper conduct and etiquette ahead of time. But I find that teachers expect kids to know how to navigate the web just because they play video games and go on my space all the time. Some of the best “teaching moments” have come from mistakes that my students have made online, everything from using a derogatory remark to posting a personal email on a wiki. I try to use these as times to stop and reflect on how they could do it better. On the down side, it takes lots of time to monitor, but without that, the learning “how to” and “how not to” doesn’t happen. We always learn the most from the things we hope to never repeat again (at least I usually do).